The instant of greatest eclipse takes place on 2020 Jun 21 at 06:41:15 TD (06:40:06 UT1). This is 6.2 days after the Moon reaches apogee. During the eclipse, the Sun is in the constellation Taurus. The synodic month in which the eclipse takes place has a Brown Lunation Number of 1206. The eclipse belongs to Saros 137 and is number 36 of 70 eclipses in the series. All eclipses in this series occur at the Moons ascending node. The Moon moves southward with respect to the node with each succeeding eclipse in the series and gamma decreases. 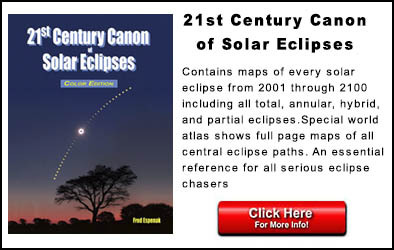 The annular solar eclipse of 2020 Jun 21 is preceded two weeks earlier by a penumbral lunar eclipse on 2020 Jun 05, and it is followed two weeks later by a penumbral lunar eclipse on 2020 Jul 05. The eclipse predictions are given in both Terrestrial Dynamical Time (TD) and Universal Time (UT1). The parameter ΔT is used to convert between these two times (i.e., UT1 = TD - ΔT). ΔT has a value of 69.7 seconds for this eclipse. 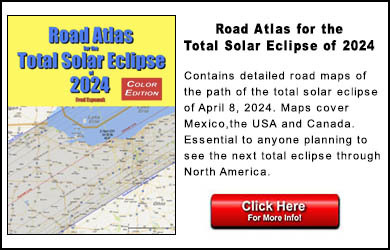 The tables below contain detailed predictions and additional information on the Annular Solar Eclipse of 2020 Jun 21 . Eq. Hor. Parallax 08.7" 0°56'31.1"
Predictions for the Annular Solar Eclipse of 2020 Jun 21 were generated using the JPL DE406 solar and lunar ephemerides. The lunar coordinates were calculated with respect to the Moon's Center of Mass. The predictions are given in both Terrestrial Dynamical Time (TD) and Universal Time (UT1). The parameter ΔT is used to convert between these two times (i.e., UT1 = TD - ΔT). ΔT has a value of 69.7 seconds for this eclipse.